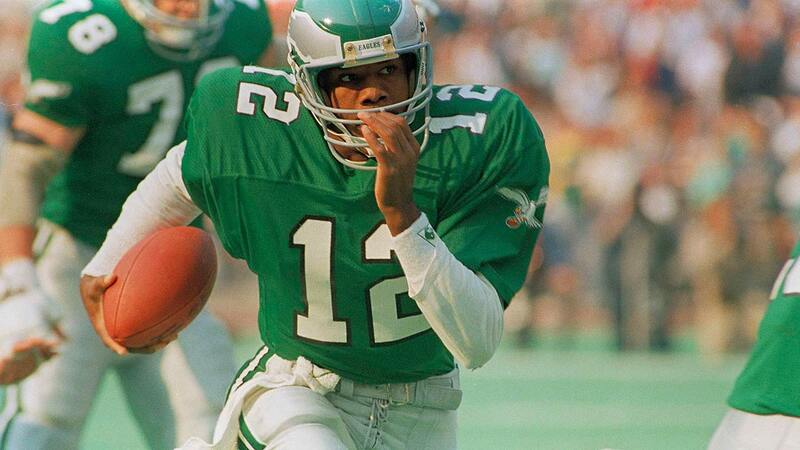 PHILADELPHIA -- Many fans of the Philadelphia Eagles have long championed for the return of Kelly green uniforms. Though his latest attempt was denied, owner Jeffrey Lurie is determined to grant that wish. The Eagles owner confirmed that the organization's recent proposal that would allow teams to wear alternative helmets was in the name of getting the Kelly green uniforms back into the mix. "I want to see us use Kelly green as our alternate and Thursday night type of uniform," he said at the league's annual meeting Tuesday. "And the only thing blocking us is we can't use the Kelly green helmet yet. So that's what we're waiting for. We're going to keep pushing at it." The team withdrew the proposal from consideration this week because they were told that it wasn't going to pass. But there is support around the league for this, per Lurie, and the hope is that they'll be able to have it passed by next March. "We're going to keep at it because we're really determined," he said. Asked whether there is any thought to going back to Kelly green as their main jersey, Lurie noted that he wanted to do a trial run first for a few games to see if people liked it. The reasons why there is resistance from the league to allow for an alternative helmet is "complicated," Lurie said, declining to get into details. The Eagles' classic Kelly green jerseys were permanently traded in for "midnight green" in the mid-90s. 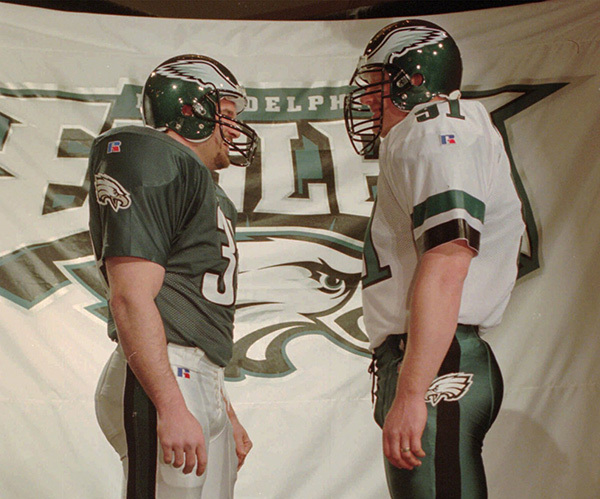 Philadelphia Eagles Kevin Turner (34) and Andy Harmon model the new Eagles uniforms on Monday, February 5, 1996. However, the Birds wore Kelly green in the 2010 season opener to celebrate the 50th anniversary of the 1960 NFL Championship team. Philadelphia Eagles quarterback Kevin Kolb in the first half of an NFL football game against the Green Bay Packers, Sunday, Sept. 12, 2010, in Philadelphia. There has been a groundswell of support to bring back the old look, with droves of fans taking to social media and even signing petitions to try to get Kelly green back into the fold. "It's overwhelming for me, too. I would love to see it," said Lurie. "I love the midnight green, I think it's great, but I also want the Kelly green. I would love to have both and have us some games have one and some games have the other. I think it's more fun."